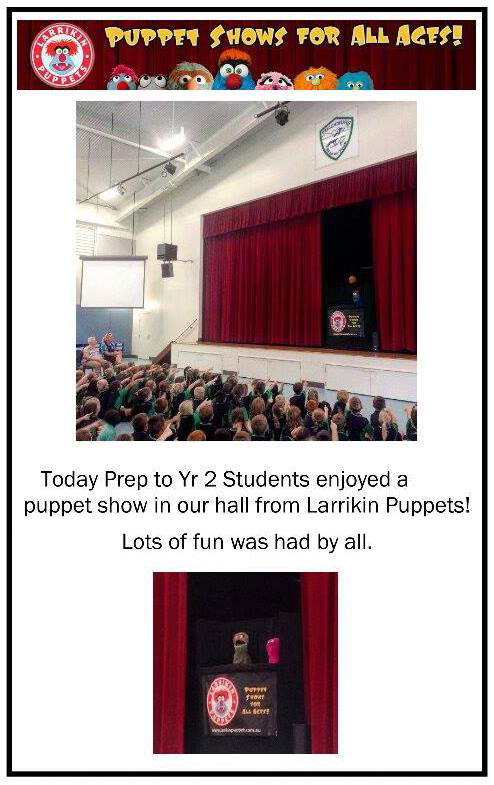 Larrikin Puppets perform a puppet show for schools that can be both educational and very entertaining for students and teachers alike! 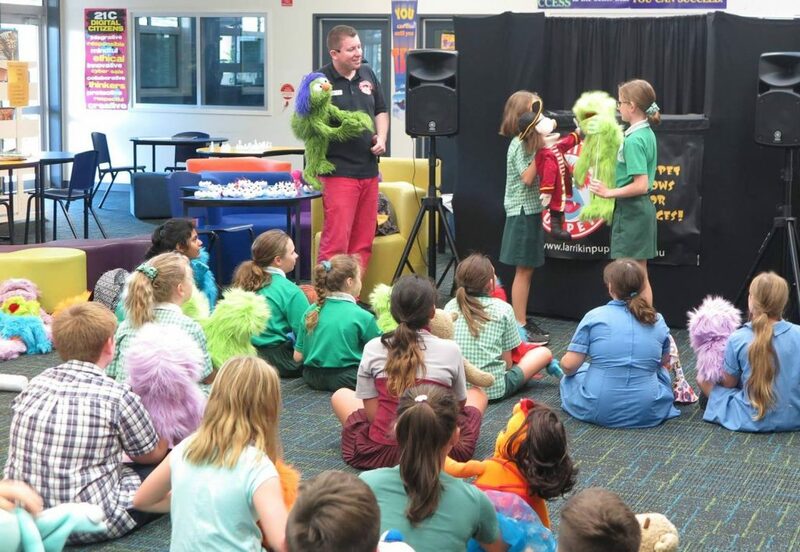 Puppeteers Brett Hansen and Elissa Jenkins and their funny characters provide top quality entertainment and fun for schools in and around Brisbane, the Gold Coast and Sunshine Coast. See below for full details on how you can treat the students to a special session of puppetry at school! Our puppet show is a colourful and fun 30 minute variety show of songs, skits, jokes and games. The style of puppetry is like The Muppets and Sesame Street. It’s all interactive and live (rather than pre-recorded). 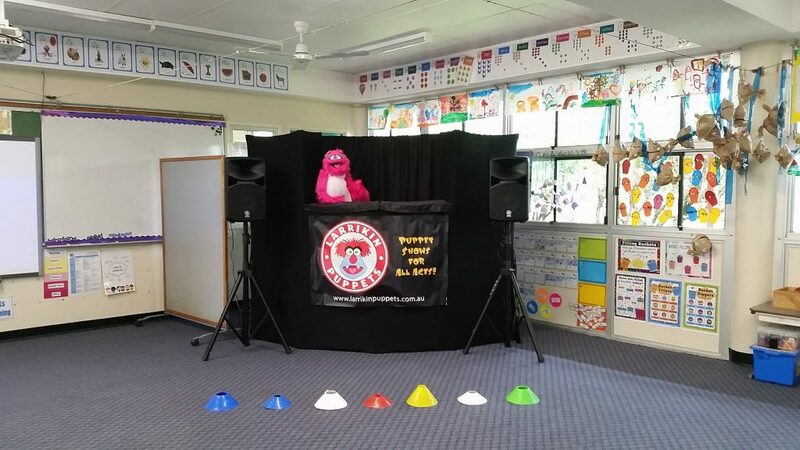 Kids are encouraged to sing, dance and play along. The show is followed by an additional 5 minute presentation where we demonstrate to the audience how all the different puppets in our show work. Then there’s a bit of a meet-and-greet and photo opportunity where the kids can then get their photo taken with “Troggg” the friendly blue monster and his little sister “Marina”. 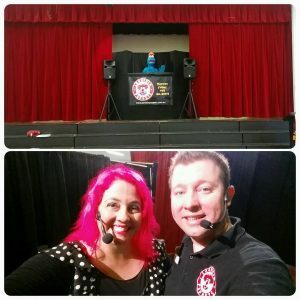 These shows can be performed either in the school hall, in a classroom or in the library. 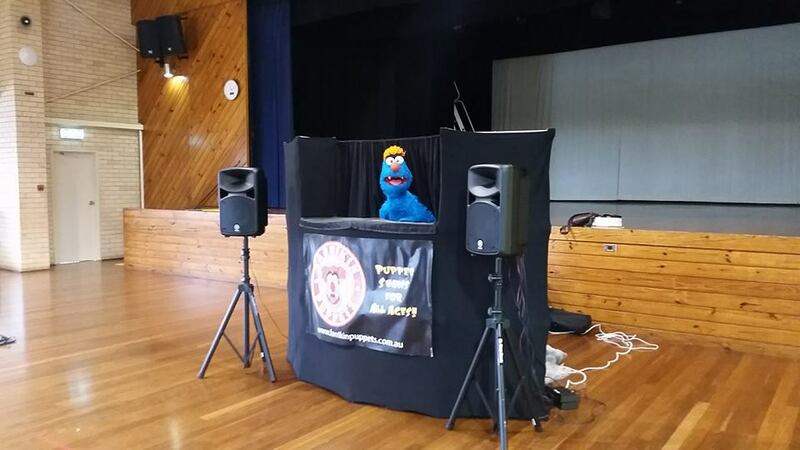 Our general comedy puppet show always goes down a treat, but you can ask us in your enquiry if you’d like any educational material incorporated into the show. We have performed puppet shows themed around healthy eating, food allergies, Autism acceptance, friendship, anti bullying, World Environment Day and World Puppetry Day. 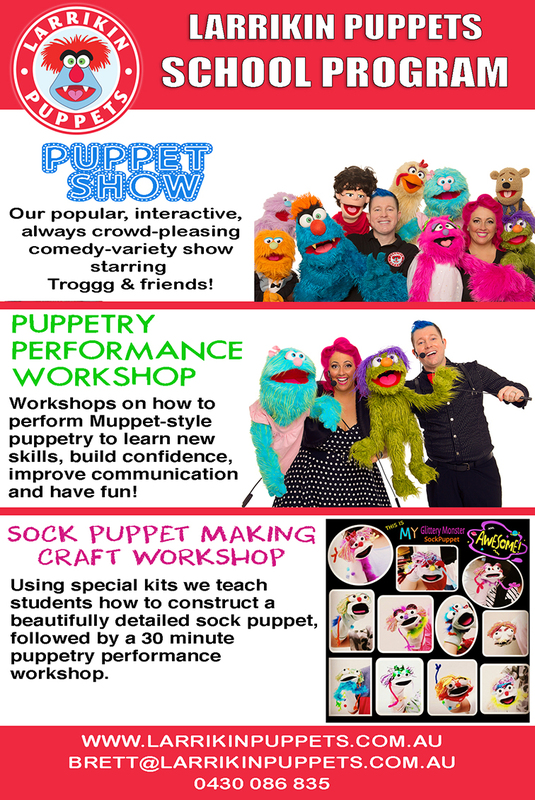 We also offer a 1 hour workshop where Elissa and Brett teach Muppet-style puppetry performance for beginners. We don’t teach the building/craft side. Just the performance side. We bring along 40 workshop puppets for students to practice with in the class. We teach lip sync, eye focus, walking, arm movement, character voices, etc. 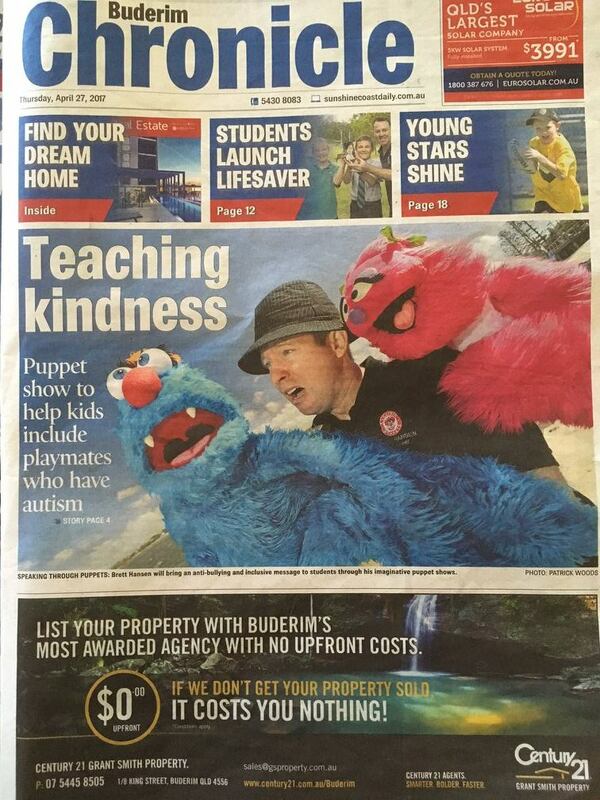 Puppetry is great for building confidence, improving communication and making people laugh. Students get an opportunity to come up on stage and demonstrate what they’ve learnt in the class. The workshops usually begin with a short puppet show to demonstrate how the puppets look when performed. Total Workshop Duration: 1 hour. Brett and Elissa have current blue cards, are fully insured, professional, and punctual. Content on healthy eating and food allergies has been sourced from consultations with expert naturopath and nutritionist Lauren Stark BHSc from Naturally For You Health & Wellness. 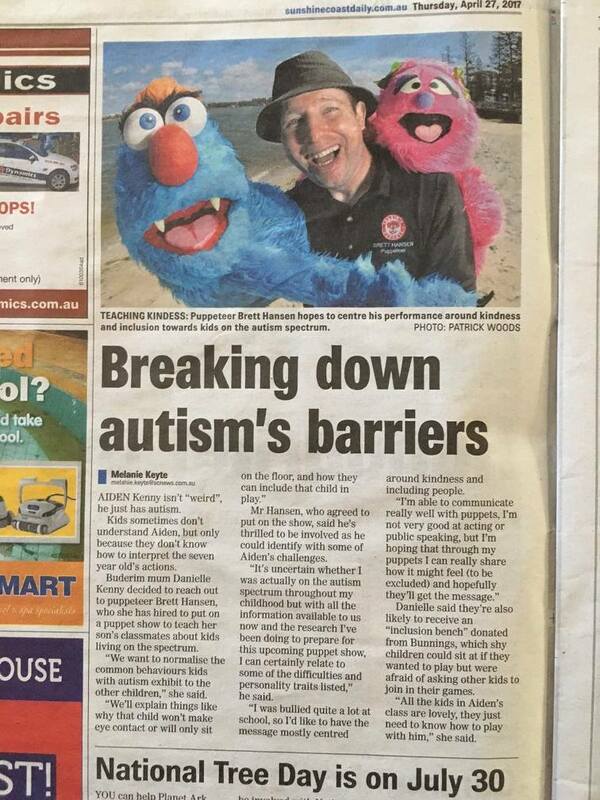 See the article that 612 ABC Brisbane’s Spencer Howson wrote for Bmag about Brett Hansen and Larrikin Puppets here.